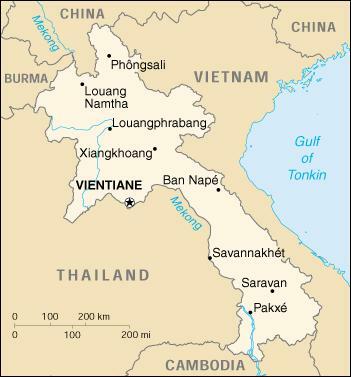 Christianity was first brought to Laos at the end of the 19th century. RCath missionaries began work both in the north (1881) and in the south (1886) of the country. The first Prot witness was that of a Presb missionary, Daniel McGilvray, from the USA, who started evangelistic work in the north. He was based in Chiang Mai, Thailand, and from there made several journeys to Laos between 1872 and 1898. A few communities came into existence. The first Prot church was founded by two Swiss missionaries in the south. Gabriel Contesse and Maurice Willy established a mission station in Sing-Khône in 1902. Work proved to be very difficult. Epidemics took a high toll. Contesse and his wife died prematurely in 1908. Other missionaries followed, and by 1936 twelve communities had been founded. In 1928 they were joined by missionaries of the Christian and Missionary Alliance. Three Gospels were translated into Lao in 1908; a translation of the full Bible was published in 1932.